How can you not love this man? Wonder Woman, Cat Woman, Joker, etc. all on the iPad for our viewing pleasure. Well now Jim has provided us with a wonderful drawing of Batman, the iPad edition. 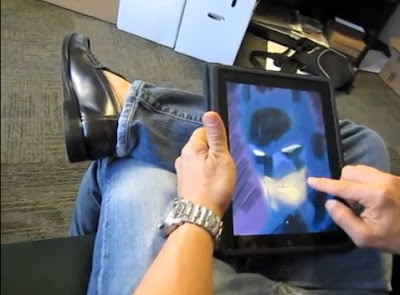 "This is a very sped up clip of me messing around on my iPad. Original video was 20 mins in length; it usually takes me about 60-80 mins to get one of these pieces done using @sketchbookpro. I prefer using my finger to a stylus of any sort--makes it more fun. I honestly have to say this piece was not going in the direction I wanted so I stopped and got back to real work : ) but you get a general sense of how I layer on colors and work positive and negative shapes back and forth to get edges...like in painting." This is an extremely well written article. I will make sure that I will bookmark it and open this page again to read this useful information provided by you.